Are you curious about what an air compressor can do for you? Check out this blog for 10 surprising air compressor uses and how buying one can be helpful to you. Do you know much about air compressors? If you aren’t familiar with them, you may be surprised to find out just how versatile they are. Whether you own one or are considering purchasing one, it’s hard to go wrong with an air compressor. The number of air compressor uses is impressive if you do just a little bit of research. From painting to cleaning, to countless other tasks, an air compressor can be a great addition to your existing tools and gadgets. While some users are probably fairly well known, others may surprise you. 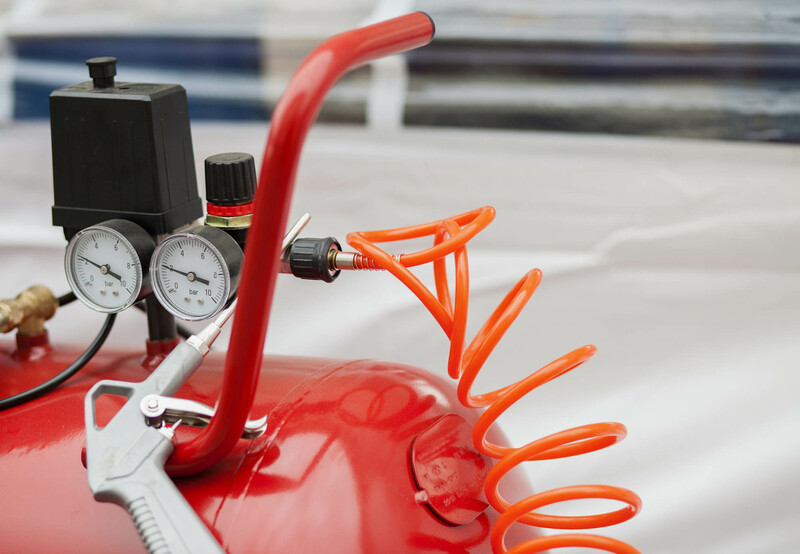 Read on for our list of ten surprising things you can do with an air compressor. Substances such as ground apricot pits and corn gluten mill have been used in weeding. Using such natural substances allows you to feed your soil while blasting out the weeds. Utilize the high pressure of your air compressor to cut down on your time spent in the garden. Dairy farmers may find air compressors to be highly useful. They can be used to power milking machines, providing that suction power that’s needed to get the job done. Air compressors are also great for cleaning. Milking areas can be power cleaned thanks to the pressure of an air compressor, saving farmers time while doing the job well. Use your air compressor to apply sprays to your trees each year. Using your air compressor with a spraying unit will help you reach the tops of trees. This makes your spraying work much easier than it otherwise could be, simplifying the process of protecting your trees from diseases and pests. Looking to enjoy some paintball fun with your buddies? Well, look no farther than your handy-dandy air compressor. Use your air compressor to make your own, homemade paintball gun! Be cautious when doing this, though. Make sure you wear protective gear at all times and that other safety precautions are taken. Once you’ve made your homemade gun, your potential for paintball enjoyment is endless and right at your fingertips whenever you want it. Are you a fan of underwater exploration? Did you know that air compressors are used to allow for underwater breathing? Whatever your reasons for enjoying being underwater, that enjoyment is possible because of air compressors. Diving cylinders utilize compressed air so people can enjoy being underwater for extended periods of time. Without that compressed air, you’d have to rely on your own lungs, which would limit your fun immensely. If you’re a fan of snow, you may love this idea. Use your air compressor to make a snow machine! Using a mix of compressed air and water, you’ll find yourself enjoying that white fluffy stuff whenever your heart desires it. Are you looking to add a cool design to a vehicle or some type of gear? An air compressor can help you get the job done. Whether you’re looking to add detail to a bike helmet or customize the sides of your car, compressed air will get you the power you need. Several types of air compressors exist and you’ll need to find the right kind fo your specific project. Check out aircompressorsusa.com/Ingersoll-Rand to see several types of compressors. If you work on any projects requiring a lot of nails, an air compressor can be your best friend. Nail guns will speed up just about any project, thanks to compressed air. Carpentry and crafts will be far easier. Really any building project can be helped along by a nail gun. If you’ve ever re-shingle a house, you’ve likely benefited from one of these machines. If you maintain your own vehicles, an air compressor is a great tool to have around. Bolts in awkward, tight places and easily be removed thanks to the power of compressed air. And you’ll never be left with a tire that’s low on air if you carry your air compressor with you. Smaller, more mobile air compressors are great for filling up deflated tires. If you have a larger compressor you can fill up your fires from home. This eliminates those pesky visits to the gas station or car wash. This makes your air compressor both handy and time-saving! Do you like to work on a lot of projects at home? If you do, you will likely benefit from using an air compressor. Sandblasting, thanks to the power of compressed air, can help with the removal of various coatings. This would especially be helpful if you enjoy working on metal or wood. Paint and rust can both be removed from old items by using an air compressor. Other substances may be removable as well. When using your air compressor in these types of situations, make sure you properly protect your lungs by wearing safety equipment. Air compressor uses are literally endless if you know how to use your machine. From cleaning to working on projects, your tasks will be made easier, and more fun, when you add compressed air to the mix. Work projects aren’t the only things that benefit from air compressors, either. You may just end up having some fun, too.